With the equivalent of one stroke of the pedal, Cambiatta made a strong push to launch their new cycling Data Acquisition Tool and training software. Cambiatta has hired Frankie Andreu, one of cycling's most popular names, to lead the sports marketing efforts, and serve as spokesperson for the company. At the same time, naming Susan Williams, formerly of Jamis Bicycles, Director of Business Development to develop, and manage all distribution and sales of Cambiatta products. Founder, Patrick Walters, is very excited about bringing Andreu and Williams on board. Though they bring different strengths and will serve different needs for Cambiatta, the two share a common knowledge of the cycling industry. 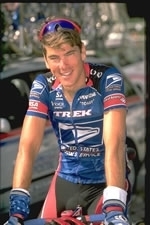 "Frankie is well-loved in the cycling industry and were thrilled to have him officially join Cambiatta," said Walters. "He has lent his endorsement to Cambiatta during development over the last year, and with his record in the Tour de France as a member of the U.S. Postal Service cycling team, and current position as commentator with OLN Television; he substantiates the value of Cambiatta to the cycling industry." New to the world of cycling, Cambiatta records, stores, downloads, and analyzes the data from your existing cycle computer and HRM allowing you to keep using your current equipment; while eliminating any need to learn a new system. During the launch of this add-on training tool, Andreu will be responsible to help build brand awareness through all aspects of sports marketing including sponsorships of cycling events and cycling teams. "I'm excited to be a part of Cambiatta," said Andreu. "I think this new technology is a great way for cyclists to take the next step and improve." Like Andreu, Williams too is recognized in the cycling industry, most recently having spent 4 years with Jamis Bicycles. Using her knowledge of dealers throughout the Midwest United States, she'll be responsible for sales revenue by developing, and managing all distribution and sales through multiple channels of distribution for Cambiatta. "Susan has the business development, and industry experience necessary to help accelerate sales during our product launch," claimed Walters. "Again, we've been able to use industry resources to bring in a high quality individual who lends instant credibility to Cambiatta in the cycling industry." The Cincinnati-based company focused on creating technology-based fitness products has aimed its initial product launch directly at cycling enthusiasts already using a cycle computer and heart rate monitor as part of their training tools. "Cambiatta is a great product," said Williams. "I'm very excited about the opportunity, I love the cycling industry and this is a perfect fit for me." Since hiring the two, the company is already experiencing movement in the cycling industry. Formal negotiations are underway for sponsorship of an elite cycling team, sponsorship of numerous popular cycling events across the U.S. is in place, and dealers and distributors are now stocking Cambiatta.